This sun-dried tomato jam is the perfect balance of sweet and tart. It is super easy to make and will keep in the fridge for 6 weeks. That is if you can hold off eating the entire jar for that long. A few years ago I bumped into someone I had been at high school with. I would not have recognized her at all. But she recognized me. I have not changed much since I was that age. She was new to Somerset West and I suppose felt quite alone. She suggested we meet up for coffee and so I gave her my contact details. To this day I have not heard a word from her. It seems in general saying you want to meet for coffee and actually meeting are two separate things. I know people who make plans, and then at the last minute, cancel them. I would rather they actually did not make the arrangement in the first instance. Or friends who say they would love to catch up but don’t commit to a date. Really, rather don’t offer. My life is full enough without empty promises. I like to stick to my commitments and one of them was getting through the recipe book reviews I need to do. I like to make something from each book I am reviewing. My copy of Jan has been patiently waiting for me. 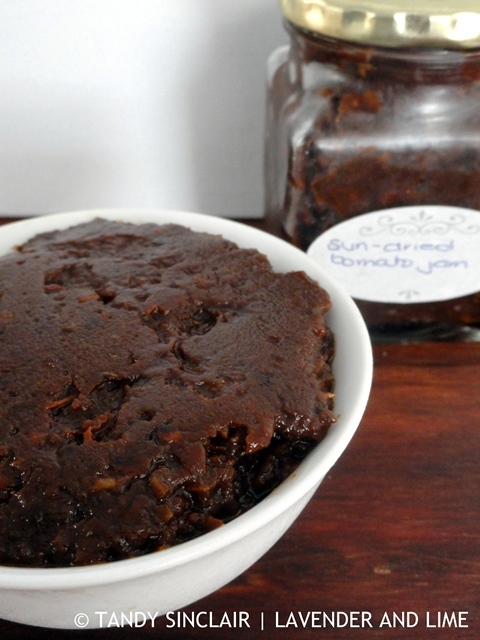 First I made a loaf of bread and then I made this sun-dried tomato jam. I am slathering it on everything. It is perfect on toast with cheese, and even better on baked potatoes. I made two jars and Jan suggested I give it away as a gift. Which I might do when I make a second batch. Disclosure: This recipe is published with permission and forms part of my review. This post is in line with my blogging policy. This sounds like it would be a great condiment to add to a sandwich such as chicken or turkey. 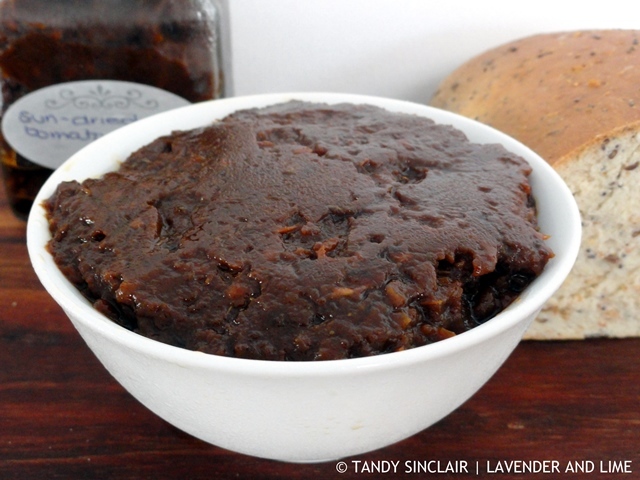 As much as I love sun-dried tomatoes, I’ve never thought to make a jam out of it before. What a unique idea! This looks absolutely delicious! I am not a sweets person in general so this is the perfect jam for me. This is such a great idea Tandy! I could imaging using that jam in so many different ways. First of all I love sun dried tomatoes so I really want to give this a go! And secondly I can’t stand it when people say that they want to catch up and don’t bother. Why bother? It drives me crazy. I love this type of jam as it goes with anything really. I think this would be choice with a vintage cheddar. Yum – this sounds delicious. I imagine it would really lift pizzas up to the next level too. Hi Tandy, I feel the same way you do about commitments, life is too short. What a wonderful jam you have shared here, looks absolutely delicious. Thanks for this lovely recipe Tandy. I love that there are so many ingredients I love — can’t wait to try it. This is something I always wanted to try, now I have a great recipe. Thanks! How amazing would this be on a cheese platter! Love this idea. Sounds like a lovely jam, Tandy.